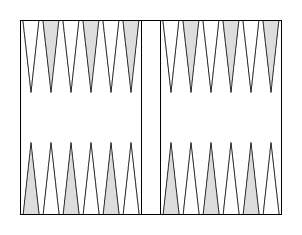 The position illustrated in Diagram 1 occurred in one of the early rounds of the 1978 World Amateur Backgammon Championships in Las Vegas. Playing the Crawford Game, Black was leading 10–8 in a match to 11. Black needed only one point to emerge the victor; it would seem that simply making his bar point would be appropriate (Diagram 2). 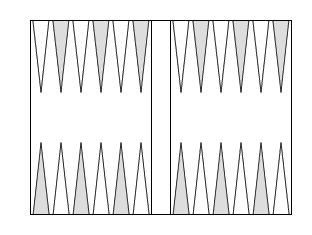 Secondly, moving the man on the 20 point to the midpoint might also be considered (Diagram 3). Diagram 2. Black plays 13/7, 8/7. Diagram 3. Black plays 20/13. Before reaching a final decision, Black should assess the situation according to the score of the match. If White wins this game the score will be 10–9. He will double as soon as possible in the next game, and although Black will have a free drop, the next complete game will determine the winner. Therefore, aside from the slight advantage of the free drop, should Black lose, it is inconsequential whether he loses a single or double game. This is a most valuable piece of information. Black can now formulate a game plan with the sole objective of not losing this game rather than attempting to win while protecting against a gammon. With this more enlightened perspective Black can select the move that will best enable him to bring his game to a permanent position of strength. Isolating the hot spot on the board, the 5 point, he can take measures to secure that point. The 5 point will immeasurably improve both his offensive and defensive stance. By hitting twice (Diagram 4) he gains the tempo necessary to maximize his chances of success. Diagram 4. Black plays 8/2*, 6/5*. If White return hits, Black has increased his chances of establish the 20 point. This is equal to long-term survival in the game. If White fails to return hit, Black has 25 numbers with which to make the 5 point, and 9 of the 11 numbers which do not enable him to do so allow him to cover the 2 point. If the blot on 2 is hit, that man is regenerated. Thus we have a classic example of exposing only "one" blot in exchange for sending two of the opponent's men to the bar. White rolls 1-1, 2-2, 3-3, or 5-2, followed by a poor or no re-entry by Black. Aside from the mathematical improbability of this occurring, it is far more advantageous to be vulnerable to a small number of jokers now than to be at risk to average numbers for the duration of the game. One of the most salient differences between the amateur player and the professional is the latter's ability to adapt his rolls to his game plan rather than the amateur's strategy of adjusting his game plan to his rolls. In the actual match, Black succumbed to fear and decided to "clean up his blots," moving 20/13, leaving the man on 22 stranded. This served to trigger the panic button in White who immediately undertook a desperate suicidal close-out in order to stop the last man from escaping. Unfortunately for Black, the blitz was as effective as it was inappropriate. This completely reversed the momentum at the table and the concluding game was little more than a mere formality as White pre-empted the match. A common foible of even experienced players is the tendency to "enjoy the lead," attempting to protect it at any cost. This precipitates poor evaluation of the score at hand, followed by passive moves and feeble game plans.